Each of my dogs is given individual attention, care, exercise and training. Early stimulation and continued socialization are very important to the mental development of puppies. My puppies are not raised in a kennel. They are whelped here in my home and stay inside with me until they are 3-4 weeks old. During this time they are closely monitored to make sure that each puppy is getting the attention that they need to develop properly and also that they all have equal opportunity to mother's milk. When the pups are moved outside they are kept in an area where they will have consistent outside stimulation to all the happenings on the farm! They get tons of attention and are always a favorite with horse clients when they come to visit. My little Papillon also loves to play with the puppies and this is an excellent socialization tool for getting the puppies accustomed to small dogs. At an early age the puppies are taken on short outings where they learn to follow and come when called. I also try to work with the puppies on having respect and boundaries with their human handlers. 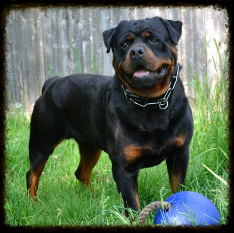 Rottweilers naturally have a strong temperment and early training definitely makes a difference in their life. It is very important that obedience training is continued when the puppies go to their new homes. There are no "bad dogs," only those that are inappropriately placed and raised. I try to get to know each puppy individually and so that I can recommend them to a home that will be a good match with their individual personalities. Please feel free to contact me with any questions that you may have. Thanks! 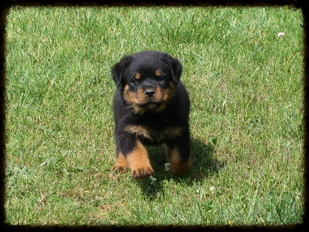 Welcome to Gentry Creek Rottweilers, I am Amy Mitchell. My husband and I live in the mountains of beautiful Laurel Bloomery, Tennessee on a 100 acre horse farm. All of our animals are part of our family and we are very dedicated to them. Our breeding dogs are imported directly from Europe and are picked for their exceptional temperments, beauty, health history and world class pedigree. The dogs are not kept in a kennel atmosphere. They are workers here on the farm with me and spend their days running in the fields, laying in the grass or following me out on horseback in the mountains! My dogs are part of all of the everyday activities on the farm and on the weekends we take them out backpacking(they carry packs), rollerblading or to any number of events where they are exposed to a variety of sights and sounds. People are always amazed at how well behaved, patient and social my dogs are. They get along great with children, other dogs and animals and are confident in many situations. Much of this comes from correct training, but a strong, confident and stable temperament is also part of a history of excellent breeding and selection. We don't just look at a dogs looks or pedigree when deciding on breeding, the dog MUST have a stable temperment. No matter how beautiful the dog is or how many shows the dog has won for conformation, if he/she has a weak temperament the dog will not be bred. Finding appropriate and loving homes for our puppies is very important. Our dogs are raised to be loving and loyal family companions. They come from excellent European bloodlines, and I don't mean in their distant pedigree. All of our breeding females are imports out of the top European bloodlines. Almost every dog in their pedigree is a champion or a titled dog. The puppies have extraordinary looks with large bone and a big head with lots of expression and intelligence. They are what a true Rottweiler is meant to be... Absolutely stunning to look at with a stable temperament, sound body and amazing intelligence. blessed to have such wonderful and gentle animals sharing my life. 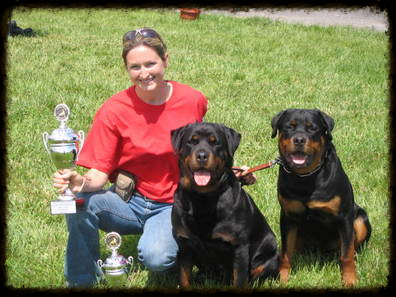 For me, breeding Rottweilers was not something to be entered into lightly. Breeding any animal is a huge responsibility. In order to take good care of the animals and breed Rottweilers of quality, it is extremely expensive not only to import breeding stock from overseas, but to properly care for the puppies and adults. If there is profit I invest it back into my program for the comfort and health of my dogs. A breeder can keep mass sub-standard dogs in kennels and breed them... selling the puppies hoping for profit and not putting any of the money back into the care and comfort of their dogs. But this is a huge dis-service to the breed. 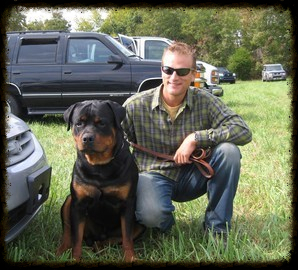 I breed for future show dogs for myself and to share the joy that a QUALITY Rottweiler can bring into a persons life. Any person pairing 2 Rottweilers can call themselves a breeder, it is important to know the motive and history behind their program.